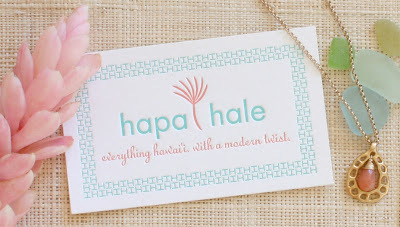 I'm pleased as Hawaiian punch to blog about a recently completed redesign for hapa|hale. The blog's author, Leigh, and I cyber-met about 2 years ago through the design*sponge feature penned by our pals Lauren & Derek about Conn's shelf makeover. We shared many common interests and design influences so it seemed a perfect match when she asked me to redesign her blog identity and site. She was well prepared and supplied me with a handful of blogs that she admired and a wish list of design tricks and functionality that she wanted deployed in the new template design. When she suggested Squarespace as a development and hosting platform, I took it out for a test drive and gave her my blessing. Using a combination of their custom style editing features, I designed the template based on the approved mock-ups and banner photography. Before all of that were a few rounds of logo design. The lowercase h's were a trademark display style that I needed to keep but I really liked how the capitol H's worked together and when placed in a pattern arrangement they do double duty as the state's abbreviated name. The simplicity of the letter forms in the title words seemed well-suited for futura, where as the client wanted a more whimsical and girly cursive for the tag line. Enter linoscript. We were both really pleased with the results. I styled the image in the top banner with a combination of things supplied by Leigh and an assortment of our own flora and seashells (all from local sources). Conn helped me out with gathering and positioning the elements. I must of snapped a zillion photos before we arrived at the perfect one. 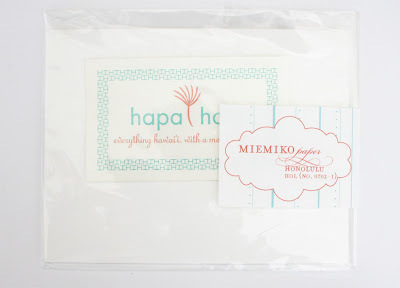 Leigh had the vision to have the logo letterpress-printed into beautiful calling cards by Meimiko. I took a photo of the card in the cello-envelope because I liked how the label complemented the design on the cards. They did a great job in the printing and color matching. Beautiful paper too. Letterpress is a wonderfully tactile medium, so nice to actually "feel" the design rather than just see it on the computer screen. so sweet of you to share with the cfc peeps! i am still swooning for the new design and so happy to finally share all the loveliness that john created for h|h. it was wonderful to collaborate with john on this project and conn was kind enough to pop in with advice too. john is quite a logo making wonder & a design genius!!! mahalo nui loa to the fabulous cfc 'ohana! so very very pretty pretty! I can smell the plumeria when I look at this. Well done. plumeria-scented design. i love that notion! mahalo everyone for the aloha.